Beard Bender. A dry cider. I have to admit, I don't drink a lot of dry ciders. I typically like my beverages on the sweeter side of the spectrum. But, I like Blake's Hard Cider. While I've only discussed one of their offering's on here (Wayward Winter, the company's winter seasonal), I've actually had quite a few more than that: El Chavo (spiced with habanero with added mango), Flannel Mouth, Wakefire (flavored with cherries and orange peel), and Tonic (with cucumber and ginger). In my mind, the cider company has a very fine pedigree. I have thoroughly enjoyed everything I've had from them. Now I'm breaking into a Beard Bender for review purposes. Will it join the ranks of Blake's' other ciders? That impressive pedigree I mentioned is showcased on Blake's Hard Cider's website. According to that, the Armada, MI cidery has been growing apples for nearly seven decades. The over 45,000 apple trees on their orchard produce 42 different apple varieties. All this intel can be found on the Blake's website. On there you can also find a link to their blog, which is promising a new fall seasonal, Black Phillip, that I'm pretty stoked to check out. Look for a writeup on it on John Likes Beer when it's available. Enough about future posts. Today's about Beard Bender. According to Blake's' online description of the cider, it's made from Bittersweet and Bittersharp apples with no additions. At 6.5% ABV, it's a drinkable dry that is compounded by tartness and crispness. On the nose, it's all apples with this cider. Which makes sense. It's brewed with only apples. Why would it smell like anything else? It doesn't smell distinctly dry. It's aroma is reminiscent of your standard, no-frills hard cider. 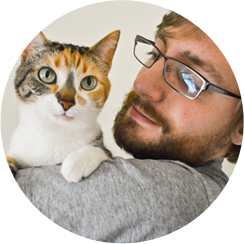 With six whiffs, Purrl didn't dislike the cider, but it's wasn't her favorite, either. Blake's really nailed using tart as an adjective to describe this cider. Crisp is another good one. The flavor of this cider showcases it's dryness. It has a little more than a mild bitterness. And, although it's dry, there is a twinge of sweetness lingering around just before the finish. I really enjoy the simplicity of it. It does pack a bit of a wallop, though, especially for those not used to dry ciders. 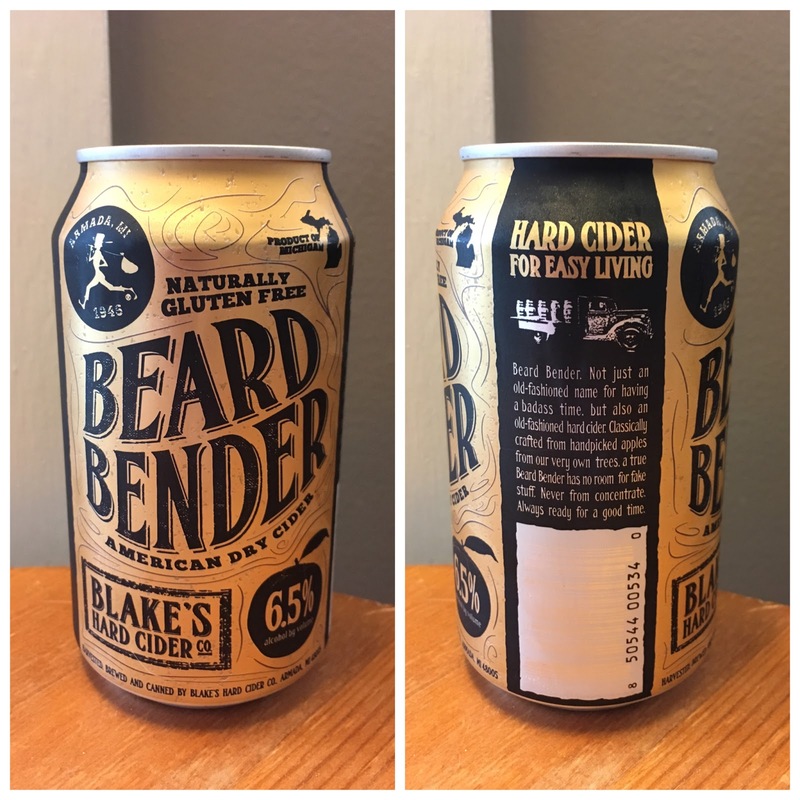 Beard Bender isn't a cider with a lot of carbonation. There is some bubbliness there, but it's not a bunch. Like a two-liter of soda that's been opened and sitting in the fridge for a day or so. I'd almost be willing to bet that the carbonation that is present within the can is a natural byproduct of how the cider was created. Regardless, each swig begets another. While I was pursuing my undergraduate degree in audio production I took an internship at a recording studio in Upstate New York. There was a mountain separating me from where I was staying and the studio. One night, when I had had enough of sitting around in my sweaty apartment, I hopped into my car and drove around that mountain. Shortly after the sun had set, I found an parking area that looked out onto the Hudson Valley. I parked my car and took in the river and its surrounding lands. I wasn't alone in this. There was a group of bikers on that overlook with me, doing the exact same thing: marveling at the world below them. That exact moment is what I'm thinking about as I sit here drinking this cider and typing this post. I like Beard Bender, but it isn't my favorite Blake's Hard Cider Company offering. This is an extremely approachable dry cider, and easily the best of the style I've had. But, as I said, dry ciders really aren't my thing. As such, I'm giving it an 8.0/10. If you like dry ciders, dive right in. You'll get more out of it than I do. If you don't like dry ciders, give this one a go. It's better than the rest and might be the first step into finding more enjoyment in the style.